Tab Cutting Services - Steve's Bindery Service, Inc.
Steve’s Bindery Service, Inc. uses the Scott Ten Thousand, allowing us to cut custom tabs of all sizes and colors. We offer both tab and edge mylar reinforcing. Every job, no matter how big or small, can be completed quickly with our automatic and hand-punch equipment. Use this downloadable Tab Layout Guide to make layout easy! Depth of the Tab: This is the distance the tab extends out from the edge of the sheet. We offer either 1/2″ or 3/8”. Size of Bank: This is the number of divisions made along the stretch of the uncut sheet. Please refer to our Tab Layout Guide. Number of Sets: This is the number of completed banks of tabs within the book. Mylar Reinforcing: In order for tabs to have greater strength and durability, uncut tabs may be reinforced with mylar. Edge Reinforcing: This is a clear strip of mylar that, when applied to the spine of a tab, improves the tab’s durability and strength. Special Finishing: This refers to many of the other processes available at Steve’s Bindery Service, Inc. These special finishing processes include: collating, 3-hole drilling, perfect binding, plastic coil and wire-o binding. At Steve’s Bindery Service, Inc., we have two pieces of equipment for tab cutting. One is operated by hand and the other is automated. The Scott Index Tab Cutting machine by Scott Precision is handfed. The Scott 10,000 by Scott Precision is automated. The Scott 10,000 is the world’s fastest plastic tab index machine. It has 10 sets of heat rollers and two sets of non-heat rollers to bond the plastic tab to various stock. Steve avoids operating his equipment at maximum capacity. He has found over the years that a slower, smoother pace means a better finished product. He also found that there are fewer malfunctions or jams, which can lead to downtime. 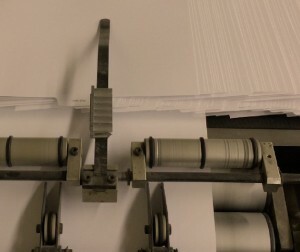 Before a full run is processed, we run one full set of tabs to ensure proper position of copy. We also review the materials to ensure there are no mistakes, incorrectly numbered pages, missing pages or other errors. The first finalized copy is checked for quality before the run continues. Should an error be found, the customer is contacted and given the chance to make changes or tell us to proceed.